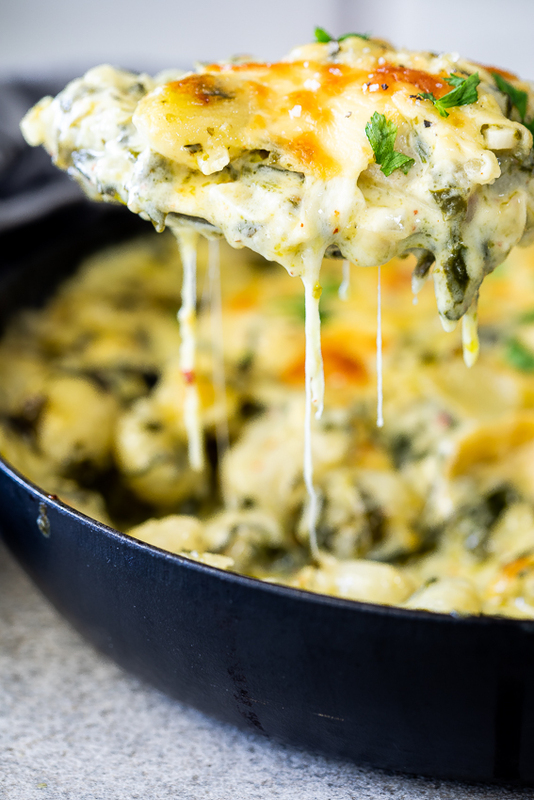 Creamy spinach artichoke baked gnocchi is a delicious, easy vegetarian dinner. 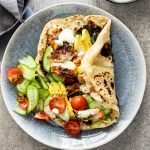 Perfect for nights when you need comfort food, presto! We are a family of gnocchi lovers. The little pillows of potato pleasure are always a hit whenever I make anything with gnocchi. 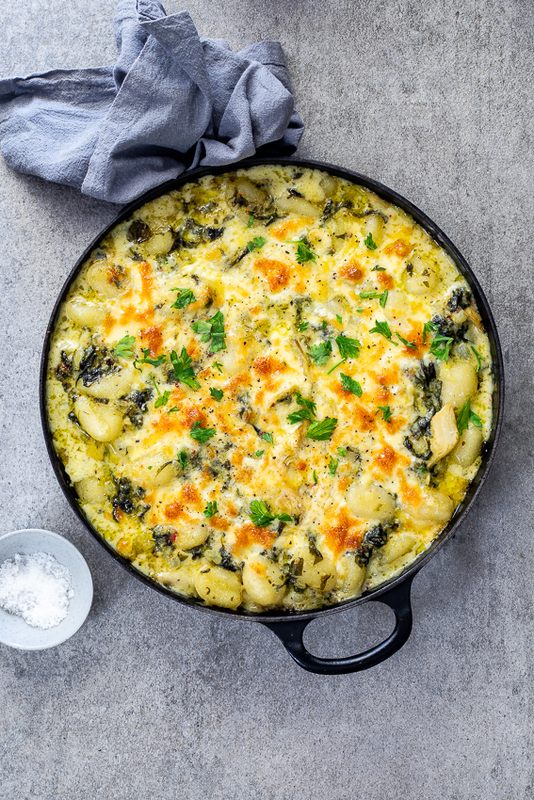 This spinach artichoke baked gnocchi was deemed the new favorite when I made it a few weeks ago and you guys, it deserves all the praise it gets. 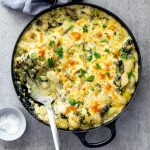 The creamy spinach and artichoke sauce is so flavorful perfect for the bland canvas the gnocchi provides. 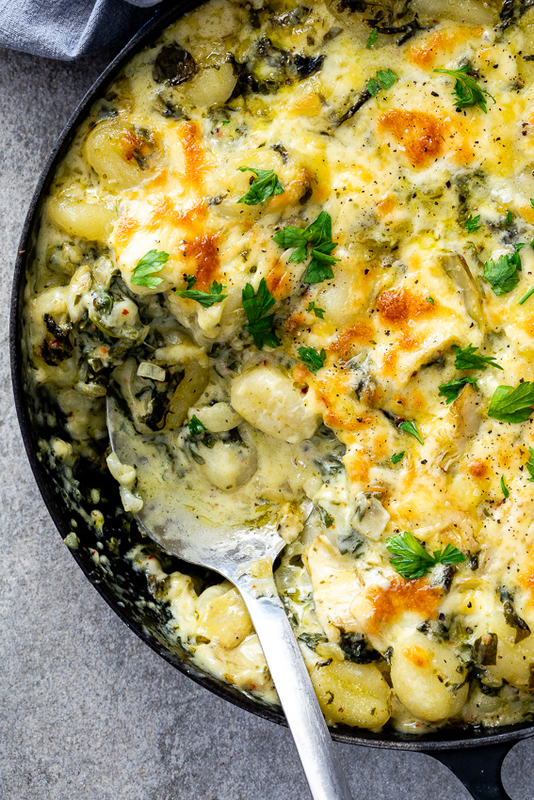 Baked until golden and bubbling until a blanket of melted mozzarella, this baked gnocchi is going to become a family favorite in no-time. Guaranteed. Saute the onion and garlic until fragrant then add spinach and seasonings. Cook until the spinach wilts then add the cream, lemon juice and artichokes. Simmer until slightly reduced and season to taste. Combine with the cooked gnocchi then top with cheese and bake until golden and bubbling. Do you have to boil gnocchi before baking? The end result is better when gnocchi is boiled before baking. The gnocchi absorbs the sauce better and this results in the gnocchi becoming super creamy and delicious. Can you buy potato gnocchi? Yes, most supermarkets will sell ready-made potato gnocchi. 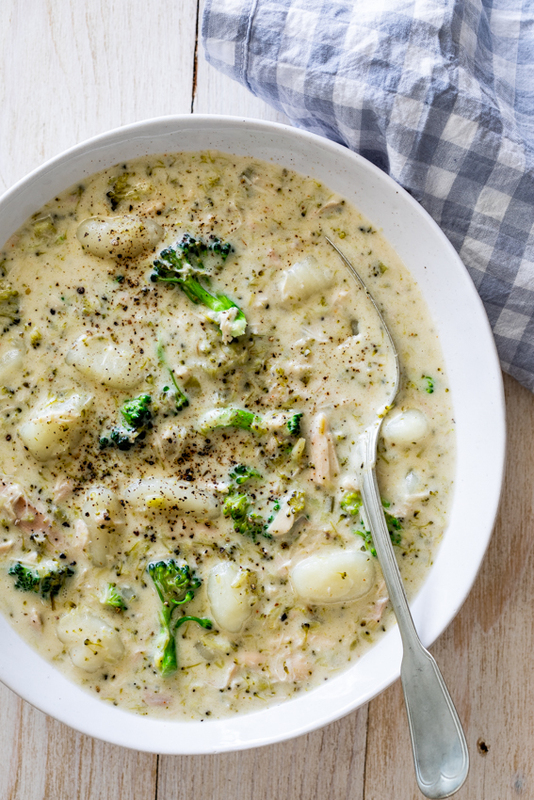 When gnocchi is baked or used in soup, store-bought gnocchi is recommended as they are denser and will keep their shape better. Fresh, home-made gnocchi is best served with sauce or as a side dish for ragu or stew. Fry the onion in a large, hot pan/skillet until soft and translucent. Add the garlic and cook until fragrant then add the oregano, chilli flakes and spinach. Cook until the spinach has wilted then pour in the cream, lemon juice and artichokes. Allow to simmer for 5 minutes until the sauce coats the back of a spoon easily then season to taste and set aside. Cook the gnocchi in a large pot of salted, boiling water until they float to the surface. 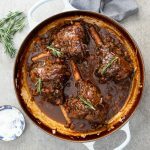 Remove with a slotted spoon and stir into the sauce. Top the baked gnocchi with the grated cheese then place in the oven and allow to bake for 10-15 minutes until golden brown and bubbling. Remove from the oven and allow to rest for 5 minutes then serve. Very good. Added more spinach as I have a surplus growing in my garden, turned out very well and family loved it. Oh my word, this was awesome. So cheesy and so creamy. I’ve never even bought artichokes before so was a little sceptical but WOW!!!! This is my new favourite pasta recipe for sure. I’m so pleased I could introduce you to a new ingredient. We use it often, it’s amazing on pizza!